Reduce room temperature: Maintain lamphead air intake below 92' (320 Q. Be sure hot air is exhausted away from the lamp head to avoid its being sucked back into the air intake. The optional HF 1 exhaust blower effectively removes head from the room. Test and clean lamphead blowers:Accumulated dirt on the blower blades blocks air flow and reduces cooling. Cleaning the blades improves cooling. To test blower efficiency, hold a piece of paper near the air intake on the end of the light housing while the unit is idling. If paper is sucked in tight and stays in place, intake is sufficient. Check reflectors:New reflectors can dramatically shorten exposure time and cool lamps more effectively. OLEC offers a variety of reflectors to deliver light efficiently for different heights and coverage areas. Existing reflectors should be cleaned regularly. Install lamps with care:To lengthen lamp life, follow installation instructions carefully. For example; Tighten thumb screws, or avoid touching the lamp quartz barehanded by using the enclosed glove and alcohol wipe (finger oil can shorten lamp life). Have an authorized technician check your lamp setting upon installation and at regular intervals: Do not open power supply unless you are a qualified technician or electrician. OLEC lights use two voltage adjustments. The first is a capacitor in the power supply. It must be switched to position "1" for lamps with numbers ending in zero, such as the L1250. Position "2" is for lamps ending in 1 or 2, such as the L1261. The second adjustment is the potentiometer on the control board that adjusts the lamps in idle voltage. Both adjustments match voltage to each lamp's requirements for optimum performance. Use spectrum optimized lamps: You can select from OLEC's wide variety of photo polymer and diazo output lamps. Using the right lamp for the job shortens exposure time and boosts productivity. 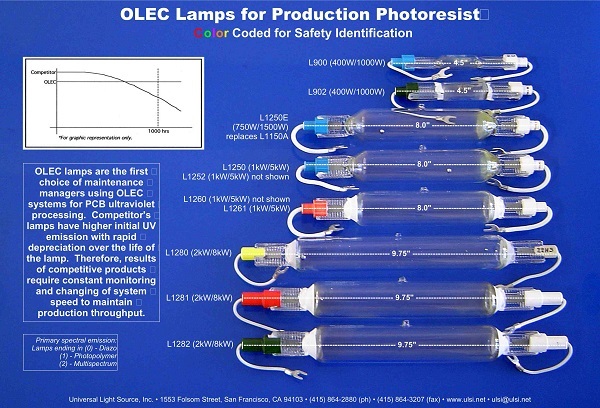 Specify genuine OLEC lamps: Brand X lamps can cause problems in OLEC equipment. They don't meet OLEC specifications and will void any warranty.